Toronto and Windsor are two major cities in the Canadian province of Ontario. They are 370 kilometers (230 miles) apart. Toronto is Canada's largest city and sits at the western tip of Lake Ontario, two hours north of Buffalo and four hours northeast of Detroit. It is the country's financial capital and top travel destination. Sitting on the Canada/U.S. border, Windsor is Canada's most southernmost city and—like its U.S. counterpart Detroit across the river—is famed for its auto industry manufacturing. The stretch between Toronto and Windsor is part of the 1,150 km (710 mi) Quebec City-Windsor corridor, a swath of the country where 18 million people—51% of the Canadian population—live. Several options are available for travelling between these two popular destinations, including by car, bus, train and air. The drive between Toronto and Windsor is a straightforward, boring one if you take the most direct route on the six-lane Highway 401. It should take under four hours. Between Toronto and Windsor, there are four rest stops on Highway 401, spaced approximately 80 kilometers (50 miles) apart. Fast food and gasoline, restrooms and free WiFi are available at these stops. Watch your speed on the 400 highways. The limit is 100 km per hour (62 mph), although a good percentage of drivers will be traveling at least 120 kph. Traffic on the outskirts of Toronto can be awful, especially at rush hour (7 to 9 a.m. and 4 to 6 p.m.). Keep a GPS handy for the fastest route and closure updates. Toll highways are not common in Canada; however the 407 highway—accessible at a cost—that leads to Toronto can be an excellent return on investment when the public highways are congested. Arriving in Toronto, you will see signs for "Collector" and "Express" lanes, which all head in the same direction, but the collectors are where you veer off in order to reach your exit; the express just stay the main course. You can move back and forth between express and collector lanes depending on traffic conditions. If you're landing at the Toronto Pearson International Airport, taking a limousine or luxury shuttle may be a reasonable option for getting to Windsor. For example, Robert Q Airbus operates a fleet of comfortable vans that accommodate between 11 and 17 passengers. VIA Rail, Canada's national rail service makes several trips between Toronto and Windsor daily. 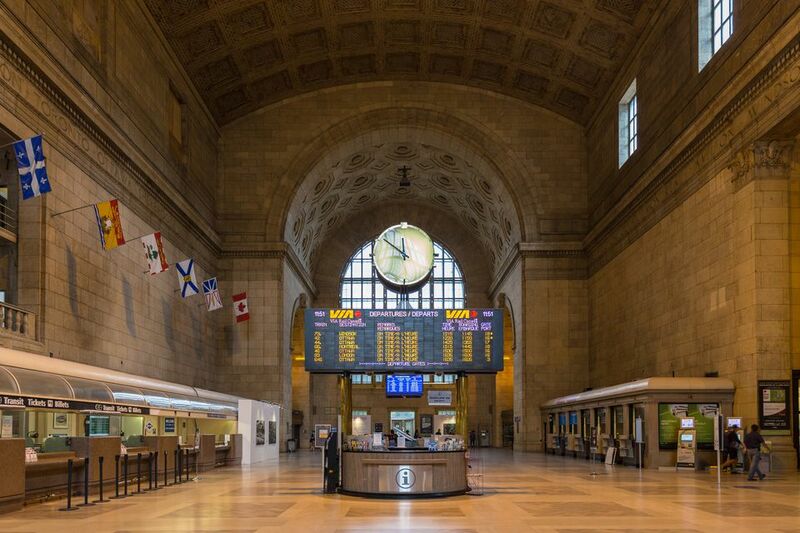 The train leaves Toronto's Union Station and arrives at Windsor's central station about four hours later. The VIA train is comparable, or of slightly better quality, to Amtrak trains in the U.S. They are clean, safe and fairly reliable (though not always on time). VIA 1 is first-class seating and gets you a meal and unlimited alcohol. Booking in advance gets you the best price (sometimes half price) and you can find additional discounts online. Economy is more crowded but less expensive. Free WiFi is available on most all trains. Especially in winter when driving conditions can be icy and dangerous, the train can be an excellent choice. Bus is the cheapest form of public transportation between Toronto and Windsor. This is not a bad choice, especially considering you're not missing a ton along the way in terms of scenic stops. Greyhound Canada is the country's national bus service and travels regularly between these two popular destinations. The trip takes between five and seven hours and makes five to 15 stops to pick up or drop off passengers along the way. Various departure times include early morning or evening. The cost one way should be between Cdn $40 and $80. Prices are as of December 2017. The short, one-hour flight between the Windsor International Airport (YQG) and Toronto usually comes at a premium price ($200-$400, one way). The earlier you can book your flight, the better the price. You have several Toronto airport options: Billy Bishop ​Airport (also known as the Island Airport, code YTZ ), Toronto Pearson International Airport (YYZ), Hamilton International Airport (an hour outside of Toronto, code ). Going to Toronto International Airport? Read this First. You may not know that Toronto has an airport right downtown.